Gov. Jack Markell, D-Del., shares a distinction with other democratic governors. The Cato Institute doesn’t like the economic picture here. Doug Rainey puts it in perspective. When it comes to fiscal issues, it is rare to see a failing grade for Delaware, a state that maintains a “rainy day” reserve fund that stayed untapped, even during the financial crisis of 2008 and 2009. But that’s what happened when the Cato Institute gave Gov. 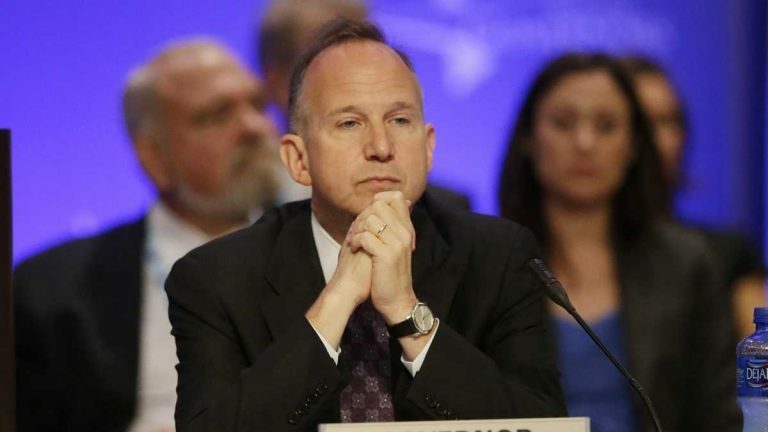 Jack Markell an “F” on fiscal policy. Somehow fellow Democrat Gov. Martin O’Malley of Maryland scraped by with a “D,” despite long-running criticism of taxes has he pushed through both houses. Chris Edwards, the co-author of the last two studies, says the bad report card was largely the result of a decision by the Markell administration and the General Assembly to stick with “temporary” tax increases that were imposed during the financial crisis of 2009. Cato took things a step further and added the administration’s proposed gas tax increase to the lists of fiscal sins. That plan died in the General Assembly amid fears that an election year tax hike could take down a few powerful Democrats. The rating did bring scattered comments and criticism. In one blog entry, News Journal reporter Jonathan Starkey wrote that the ranking was not justified. Bachman’s statement got to the heart of the criticism over the rating. As report co-author Edwards noted the grades do not take into account the state’s credit rating or short-term fiscal picture. All states are required to balance their budgets. Edwards pointed to the example of Kansas Gov. Sam Brownback, who received an “A” grade. Brownback and legislators cut taxes, but did not come up with comparable spending cuts. Brownback is now said to be in a tough fight for re-election. Not to worry, Edwards says. Kansas will be forced to balance its budget with tax increases or spending cuts. Brownback says the approach will take time to work. Critics in Kansas are not so sure and point to lower credit ratings. Lower credit ratings are a tricky issue, since higher borrowing costs will be borne by taxpayers, even if the money comes through. That may be the one area where the Cato report needs to some calibration. At the same time, it could be argued that the difference between a AA credit rating and a AAA rating does not justify the level of financial reserves that could be used for a small tax break. Markell will remain vulnerable to charges that he is too quick to suggest taxes to address fiscal problems. This is partly due to a sluggish economic recovery and taxpayers used to have someone else foot the bill in the form of corporate fees. Delaware is now struggling with that tax base. The lack of a sales tax is offset by the gross receipts tax, which taxes businesses for sales regardless of profits. (There are some breaks for smaller businesses). Casino revenues are dropping and states seeking a piece of the incorporation revenue pie remain aggressive. In the past several months, signs of a stronger upturn are apparent. As Bachman noted, the growth in employment is running above the national rate. But that good news has come with a stubbornly high 6.5 percent unemployment, rate that is partly the result of a an unexpected growth spurt in the workforce. Also lurking in the background are issues like environmental costs. Critics, such as the Caesar Rodney Institute, see the costs of the Bloom Energy deal and incentives for alternative energy sources as driving out business through high utility costs. So far, no state appears to have unlocked the secret to rapid growth. Texas may be close, but a lot of oil and gas revenue helps when it comes to dangling incentives at companies. Among the four GOP governors gaining an “A” not one has a standout economy. Of the eight Democratic governors earning an “F,” only California’s Jerry Brown has anything approaching the fiscal problems of Kansas.